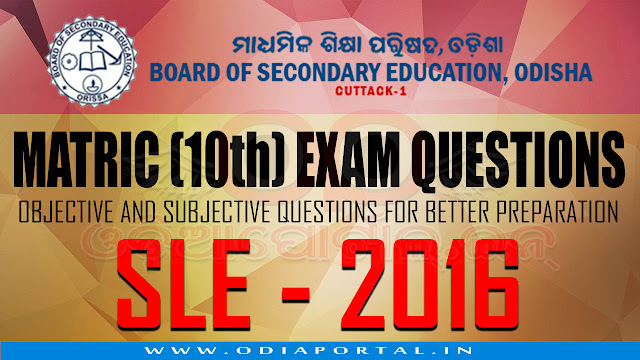 Subjective questions of HSC 10th Exam 2016 of SLE (Second Language English). A) My Mother: Name, age and qualification dress and appearance - Work and responsibilities - relationship with family members and neighbors - position in the Society - why I love her. B) My Motherland: Name and location-the people living init-their language and religion - their food and clothing-unity in diversity - how you Would like to serve your motherland. C) A Picnic Enjoyed: Place, time and members - preparation- journey to the place, your experience entertainment and return journey- memorable moments. Suppose you are Sagarika Priyadarshini studying in class-X at Govt. Girls' High School, Unit-l, Bhubaneswar. Your younger brother Ashis is staying in the hostel of Government High School, Tangi. Your brother has become a bookworm. Write a letter, in about 100 words, advising him to take part in sports and games. People who live in regions Covered with forests and surrounded by hills and rivers may find it difficult to imagine what a desert is really like. The popular belief is that it is an endless stretch of sand where no rain falls, and therefore, no vegetation grows. It is dry, hot, water-less and without shelter. But this is not entirely correct. For those who have studied it, the desert can be beautiful place. It is the home of a variety of people, animals and plants that have learnt to live under very hot and dry Conditions. True, the ground is not always hidden by a cover of grass, plants and trees as it is in other climates. But whenever it rains, Which is rare, desert flowers bloom and the Sight can be Worth watching. A desert may have mountains and hills. It may have an oasis, big or Small. An Oasis is like a green island in the middle of a desert where a spring or a well gives plants and trees a better chance to grow. One morning the famous poet's servant didn't turn up for work. Breakfast was not ready, the poet's cloths were not laid. After hours of Waiting for him, the poet's anger grew. At last When the servant appeared, Tagore burst out in anger and said to him, "Go away. Don't stand before me." The servant Went away silently. When the poet's anger abated, the so far silent Servant spoke softly, "Sir, my little daughter died last night. I loved her so much and she loved me too," Quietly the servant started doing his daily Work. (i) Who was the famous poet? (ii) Why wasn't his breakfast ready ? (iii) What did the poet order the servant when he arrived late ? (iv) Why was the servant late that day ? (v) When did he convey the sad news to his master? (i) "What faith wish had the faith of a man Who Wrote this letter. "Who said this? What did he do not to shake Lencho's faith in God? Describe briefly Kapil's achievement in the match against Zimbabwe in the Prudential World Cup ? (ii) What does Lord Eustace Percy advise students to do for keeping good health? What is acid rain and how does it cause damage in lakes and rivers?